With the ushering in of Pluto in Capricorn, the breaking down of all that is corrupt has begun and these changes will allow that which is in humanity’s best interests to replace those control objects that have kept us economic slaves for hundreds of years. By now, many of us know about the rare astrological alignment, Pluto in Capricorn, and how it brings about huge changes in society. 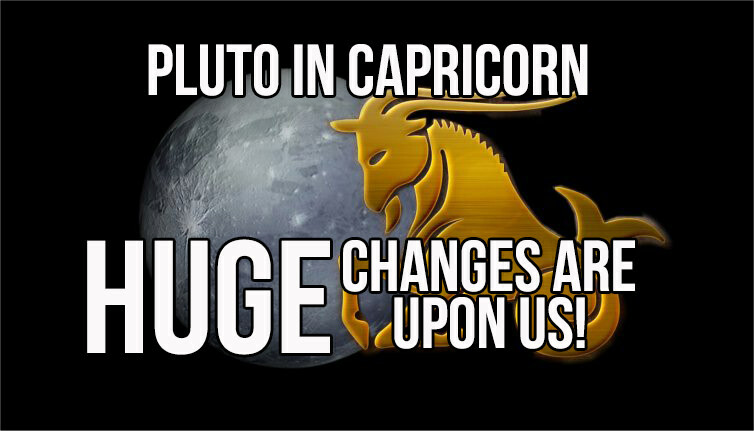 The last time Pluto was in Capricorn was in 1776, the year of the American Revolution. If you look around the world, there are many revolutions going on right now and this is not a coincidence! Pluto is known as the “Destroyer” and it breaks down everything that is bad so it can be replaced with that with that which is good. The society we currently live in will look like the Stone Age in the near future as all suppressed technologies are released. These are absolute realities in our very near future! When Pluto entered Capricorn in 2008, I originally posted a video called “Banking Collapse Announces The Beginning Of The Golden Age” on YouTube. At that point in time, many banks were collapsing and if you were to read between the lines, the message was clear. These banks, and ALL banks, were on a collision course of self-destruction. Money has always been the product of economic slavery which has kept us bridled in debt while encouraging egoistic and materialist pursuits, many of which are based on controlled obsolescence, which requires us to buy the newest or latest gadgets with no concern about the environment. We are at the juncture of an important era in time. As we exit out of the Age of Pisces and enter the Age of Aquarius, new energies will continue to infuse the planet which will bring about many positive changes as the old systems decay while new systems are implemented in the best interests of humanity. Many unawakened people will want to continue holding on to the old paradigm because this is the only way of life that they know. Other people may resist change because their belief system is unable to visualize the New Earth that is being born right now. Those who are awakened (yes, YOU that are reading this article!) will play an important role in helping others make this transition, such as helping your family members and friends understand what is going on and what options they will have. If you are unsure what to say, you can always refer them to in5d.com to catch up on the latest news and information regarding these changes. TPTW have known about the importance of astrological alignments for many years. It is quite possible that the reason they built numerous underground bunkers is to hide as a result of these changes. There are many people who have been complicit in keeping us all as economic slaves and while all people should be forgiven, some people may have a harder time doing so than others. What we will be looking at is reeducation system that helps people transition into this new paradigm. Many of us will volunteer to become teachers. Despite still being shackled in economic slavery and in the midst of numerous wars, the end is near, my friends! In the future, we will look back at these days and will be grateful for the opportunities we had for spiritual growth despite the plethora of challenges we faced. Know in your mind that we have already won and now, it’s just a short waiting game for TPTW to relinquish their illusion of control and for us to begin a new chapter in humanity!